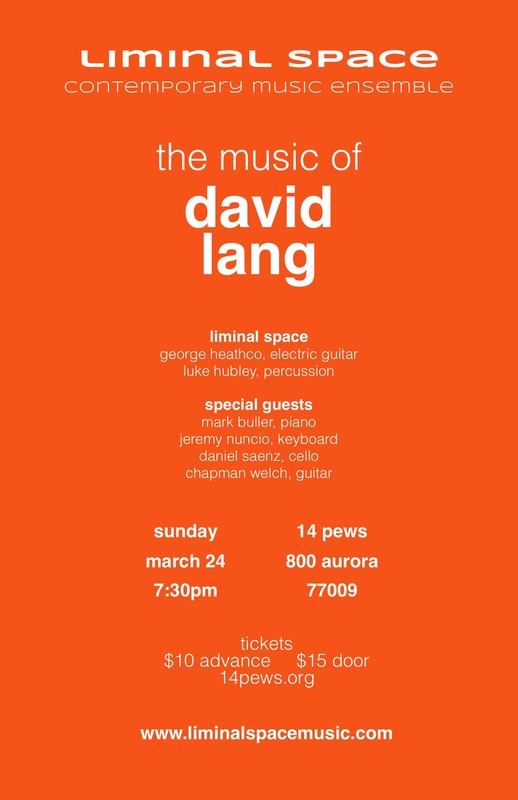 1) My group, Liminal Space Contemporary Music Ensemble, is performing a concert of David Lang‘s music on Sunday, March 24th, at 7:30pm, at 14 Pews. Anyone who has known me or my music for even a little while should already know how excited I am to present this music. Luke Hubley and I will be joined by cellist Daniel Saenz, composer/pianist Mark Buller, keyboardist Jeremy Nuncio, and composer/guitarist Chapman Welch. Works include: how to pray, lend/lease, string of pearls, warmth, and arrangements of selections from memory pieces. 2) My piece Shifting Landscape has been getting a little bit of buzz recently. SOLI Chamber Ensemble will be performing it on back-to-back nights in San Antonio, Tx. The first will be at Gallery Nord on Monday, March 25, 2013 at 7:30PM. The second will be at Ruth Taylor Recital Hall at Trinity University on Tuesday, March 26, 2013 at 7:30PM. If you are in town, please drop by and check out one (OR BOTH) of these performances. I’m especially excited about this group of performances, as I am sharing the program with some great names: Thomas Adès, Tania Leon, David Stocks, Marcus Rubio, and Rob Smith (one my former teachers at UH). After quite a few email conversations back and forth, I have come to the conclusion that all composers need fantastic performers for WAY more than just performing and promoting our music; crazy good performers can have such a crazy good eye for notational detail. I sent SOLI what I thought was a very well-edited piece, only to be sent an unnamed number of (minor and tiny) mistakes and oversights on my part. I couldn’t be more pleased that a group of musicians as great as these guys are combing through my piece. 3) In addition to the SOLI performance, Shifting Landscape recently won the Forecast Music call-for-scores. It will be included on a program for their concert on May 24th in Winston-Salem, NC. There aren’t many details as of yet, but I’ll keep everyone posted for sure. 4) Lastly, I was asked to be a member of FrenetiCore‘s inaugural artist board. The details are still a little limited as of yet, but I know that this will be a fun venture. As usual, I’ll keep you posted! Next Post Forecast Music Announces Winners of their Call for Scores.